What I am about to write down over here is part of my history – personal as well as of my friends, neighbours and people I never met but heard about. A history of a country where I lived before I moved to Canada. A part of it anyway. I mentioned to Mik Furie on his blog that I was having the idea to write about monetary hyperinflation in Serbia (actually, Yugoslavia or what was left of it after its constituting republics decided to go their own way) and how I and my family dealt with it. But before, even a thought of going through all of it again, even just remembering, would bring some bad feeling, like a big rock pressing on my chest; it felt unthinkable and even the memories were still there, I was pushing them back, somewhere in the darkest parts of my brain, to jail them forever in chains of oblivion. But now, after almost two decades, I can face them again. Both time and physical distance made it possible. Also, my life is completely different and I don’t have that bad feeling now. Even though, just a thought of living through something like that again, terrifies me. Just a piece of history as an introduction: At the end of 80s, with opening of Berlin wall and fall of Soviet Union, Yugoslavia was slowly seething inside. We all felt a big change is about to come, we just didn’t know how bit it is going to be. And how severely it is going to affect all of us. Some of the republics that were parts of ex-Yu wanted to separate, were generously encouraged to do so by governments of USA, Germany, Italy and Great Britain. First politically and financially, then with weapons and armament. Political rulers in Serbia and Montenegro were having different idea and didn’t want country to fall and opposed that. Wars started, first in Slovenia and Croatia, then in Bosnia. In return, UN (under the pressure of previously mentioned countries) imposed economic sanctions against Serbia and Montenegro (Federal Republic of Yugoslavia back then). To say the truth, I didn’t know where to start from, there are so many possible beginnings, so many angles to look at. I don’t want to go into politics, this is not what this post is all about. So I will start with the most obvious thing about monetary hyperinflation. First thing you notice is that a loaf of bread you’ve bought in a shop few days ago doesn’t cost the same as it was; or a coffee you’ve payed in your favorite café, having a good time with your girlfriend or friends; or bus ticket – actually, everything you were spending your money for didn’t cost the same. It is more expensive. More, not in terms of few coins, but in tens of percents. At the beginning – and it was spring of 1992. that I am talking about – nothing seemed more different than it was before. During 80s we were experiencing few downfalls so having prices suddenly changed, didn’t surprise us. We were sort of used to it and we knew that after few months of instability, we would be back on track. This time, actually, prices were growing rapidly and in shorter time periods, but we were all having hope that everything will be all right. Except, that it didn’t. The end of a year brought some new paper banknotes with more zeroes on them. Shops were a bit emptier than they used to be. In a meantime, I’ve lost a job, then lost another one and then another one. And each of them was payed less and my wallet was more often empty. I can’t really remember what I did during winter, I think it was when I was selling newspapers on the street. I was working – if you can call that a work – two days per week, sometimes three and money that I got would last me for the rest of the week – and then I would work again. But even with so little money, I was earning more than my both parents would earn for a whole month. The trick was that I would go and change my worthless dinars for some more solid currency and back then it was German mark. Banks closed selling of foreign currencies about a year ago so the only way to do that was to buy them in black market. But back then it was easy: dealers were everywhere. First only in few spots in a city, then literally everywhere: on bust stops, in front of shops and supermarkets, parks, schools, you name it. So, I would change my day worth of earning and that would last me longer than my parents’ salary. Luckily, they both got it immediately and my father was doing the same as I did: change it to Deutsche Mark and spend it carefully. But my grandparents were confused. Their pension money would come once a month, usually in the morning and by the evening, they couldn’t buy anything for it. Not even a box of matches. So I told them to go to shop at once and buy whatever they can – a quarter of loaf of bread, or a candle, or… anything. Yugoslav currency was so weak by the end of 1993. that in period of October 1st 1993 until the end of January 1994 prices were doubling every 16 hours (this is inflation of 5 x 10¹⁵ % per month)!!! Some money that my grandparents were having in bank (for rainy days my grandma said) disappeared into thin air long time ago and people who were having savings in foreign currency were unable to reach it because government blocked all of it – for attempting to maintain country’s stability. That was all BS of course, but on a bottom line, if you had any money in bank it was as if you didn’t have anything. We survived that year (and next, 1994) with some money I earned on a job I’ve found at the beginning of 1993 (I was not legally employed but who cared: I was bringing home some money), with money my brother earned on black market (fuel, I will tell more about it in next chapter) and on money my aunt got when her late husband’s family sold some house in a village and she got part of it (which she selflessly shared with all of us). I even managed to go to Greece that summer with my girlfriend at the time and some of our friends (earned a nice bonus on some sale but it was a splurge that costed me dearly two years later). But, most of all it was careful planning of expenditures (and a fact that my grandparents were having a small vineyard and garden in a village so we could have some fruits and vegetables grown on our own). Money was coming and going with the same speed and there was no chance to save much but somehow it all worked. And just a note: we are talking of huge amounts of German Marks that I earned. Say, about 50 when it was a good month 😛 . Between 20 and 30 when it was average (when Euro came to scene it was exchanged at rate of 1 eur for 2DEM). This is how cheap life was in Serbia back then. I’ve already mentioned that, gradually, shops were getting emptier month after month, as the crisis increased. But the biggest shock for me came at the end of July of 1993 when I returned from summer vacation in Greece. In June, everything seemed “as usual” but in only a month shops – government owned, that is – were literally empty. I remember entering into one near the building where I lived to find only one employee sitting there, shelves empty except for one where someone spread packs of paper napkins so it won’t look like there is nothing to sell. I asked if there is any bread left (I just came home and fridge was empty, my grandparents in the village for the rest of the summer) and she told me that it was sold in the morning, but there were just few loafs anyway. But, she said, you can go to a nearby, privately owned shop, they have everything. So I went there and they really had everything. I felt like in Greece again. Then I checked the prices and all of them were in German marks. Instead of wasting a lot of time in changing prices daily (and later, more than once a day), shop owners did the obvious – they were getting more than 70% of their stock on the black market anyway so why bothering. And by that time we all knew how to trade in foreign currency and some quick mathematics will give you the price in dinars, if you really needed to know. And goods were brought to Serbia mostly from neighbouring Hungary and Bulgaria and then sold in one of many open markets all over the country (open market is like a flee market but things you could buy there were brand new). I knew a man who was “importing” welding electrodes from Hungary and he was doing so good that he made a house, bought a good car and made himself a small boat, not to mention that he lived for about 6 years from that business. While it was impossible to go and buy a gas on a gas stations, you could buy it anywhere on the street. 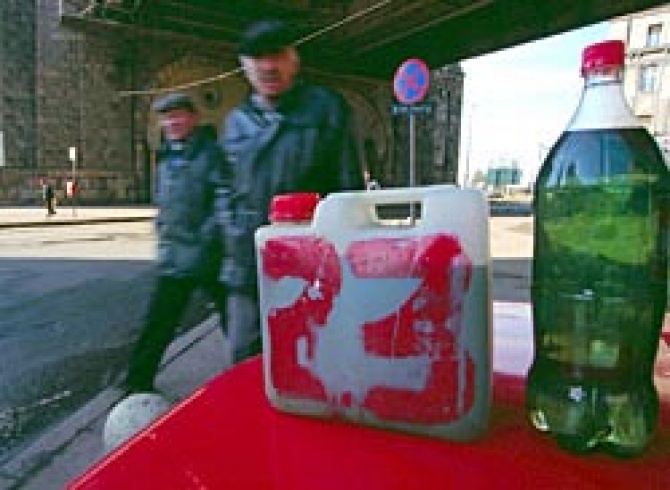 On major streets in cities and on major highways there were people standing, usually with a plastic bottle full of yellow or blueish liquid (Romanian or Hungarian, you could choose) and a price written on a piece of cardboard. My brother and one of my friends, being desperate and without money, decided to try their luck with gas. They put one big barrel and few cans in my friend’s small Renault R4 (google it and you will see how small that car is) and went to a village on Serbia-Romanian border where they knew smugglers will come to sell. On a way back, a police officer stopped them and asked how much did they have in a car. He didn’t ask them a money, that was a small amount (probably about 300 litres, btw) but told them to extinguish their cigarettes :doh: and get the hell out of there. Back home they’ve found themselves a corner and in few days sold all of it. They were doing that for about 3 months as far as I remember and then someone came to ask them a money “for protection” so they gave up. Refusing to pay could end up with serious repercussions from local criminals. Winter of 1993. was cold and wet. I got some nasty cough that didn’t want to go away and farmacies were kind of too expensive. So one day my aunt and I decided to take of one so many buses that were heading to Szeged, Hungarian bordering city, to buy some food and medicines. I remember we spent about 200 DEM for 3 bags of dried meat, salami, cheese, canned food, some painkillers and antibiotics. The price for crossing the border was about 5DEM per person and it went to border police, probably. That day I counted about 150 buses on a parking lot in center of Szeged. If every bus was having about 80 passengers and every one of them spent only a 100 DEM than we can say that it was about 1.2 million DEM worth of goods bought in that day alone. In reality, you can probably double that. And that kind of trade lasted for more than one year, although not with the same intensity, I was there in a peak of the business. Hell1 I ran out to the kitchen and back with a sandwich, thinking there was going to be more! LOL … OK I will wait. And thank you for telling this; it is good for us to hear, and VERY good for you to tell. Bad memories should not be kept inside; they turn into rats and eat your soul. Sorry for that 😀 I thought to write it all down at first, but then I realized I will need two more days and that for some people this might be too long to read. Well, the sequel is coming soon, I hope! Remember when I mentioned “rock flour” when we were talking about the colour of a lake? It’s a commonly-accepted geomorphological term. Oh, ok. Thanks for info! Ok, when part two comes, don’t read it unless you have enough time 😀 Thanks! I’m still glad those times have passed. Let’s hope they never return. I don’t know if I told you, I was in Romania in 1982, my aunt brought my brother and me to Semenik mountains for skiing. On a way there we stopped in some small town, Resita. The level of poverty I’ve seen there really strucked me. I was 13 and have never seen anything like that before and didn’t really understand why some people were getting into our bus and begged for a chewing gums or chocolate. A bus driver told me they are hungry but then I’ve seen food in shops and got confused even more. Ten years later I understood it perfectly. And that’s why I want to smack people who claim things were better “before”. Things were still decent in Bucharest in 1982; but by the time summer 1989 rolled around, the city looked like after a zombie invasion. The Revolution came just in time. I doubt many people would have survived the winter and following year otherwise. Well, I have seen just a small part of Romania and I was too young to to understand. On the other hand, I can tell for sure that things were much better in old Yugoslavia. Soon, I hope, depending on how much time I will have in a next couple of days 🙂 Thanks! Thanks for the story and History… Anxious to read the next chapters. I can understand that. For decades we were listening (and occasionally watching on the news) about Middle East troubles – wars in Palestine and Lebanon – but that never really come to us. It was somewhere else. When we got in trouble, we understood it perfectly well. Thank you for reading. I wrote another chapter yesterday and hope to write another one today so the second part of the post will be published soon. Erm, I am not sure if notification is working, a second part of this post is on line from couple of days ago and no comments so far. I was not notified about posts from some other people so maybe something is wrong at the moment. Jesus, some of this I never even imagined. I mean some of it you can sort of see when you think about it, like the black market rising and people turning a blind eye to laws to survive (coppers included). But things like getting yourself paid in a currency that you’ve figured out will go further? I wouldn’t like to think how long it’d take me to figure that one out. 90 through 94 I was a kid chucked on the street and feeling hard done by. I got myself the cheapest bedsit in the world and literally had to open the door to get out of bed. I worked nights at the local bars collecting glasses, weekends as a waiter, and two hours after school as a bouncer for a launderette (I was only going to school in the day because I didn’t want the teachers who thought I was a bad kid who’d drop out to be right). If you’d asked me back then I’d have laughed it off and said it was nothing because I was a guy and that’s what guys did as far as I knew, but I’ve always looked on those years as not only some of the toughest in my life but as tougher than any of my friends back then with their loving sandwich making parents could have imagined. Even now when I look back on it, it’s as something I can only vaguely see as the details are pushed off to the side where they can’t be seen and hurt so easily. And then I read this and it’s like my eyes are opened for the first time. I think back to that time in my life and I see myself bored because I could only afford to buy the same meals over and over, and I counted that as something tough I’d survived. To think what you guys were going through for any meal isn’t just truly humbling, it’s terrifying. I hear about this sort of thing going on at the same time, and it makes me realise just how lucky I was that life dropped a few chances in my way when I needed them. I’ve never had to deal with anything like this (I honestly don’t know how I’d handle it), and I truly hope that none of us ever have to again. I think you’ve chosen exactly the right title for this series, mate. I’m reading it, and I know it happened, and still my mind is having trouble accepting some of it. I hope you’re getting something more than pain out of writing it down. You know, my intention was not to make my readers feel sorry for me. Those things happen all over the world, at the moment I am writing this. Look at Asia and Africa. At least I didn’t have to work 12 hours a day when I was 7 years old…. It happened and passed and I hope it will never return again. When I was a kid, I had a pretty good life even though we were never rich – there was always something we couldn’t afford – but life was good. What happened during 90s makes me appreciate more life I had before and life I have now. It’s not really feeling sorry so much as realising that there have been moments I’ve felt sorry for myself over something relatively trivial. I see some of this stuff (in other countries as well) and I truly cannot imagine it. Some things make sense to me but then there’s the things you don’t even think about (like in part two where guns and the like are so cheap combining with how people need something to carry on) and how that can affect everyday life. In some ways this sort of thing will affect the man you become when you come through it, if you come through it, and reading this sort of thing makes me take a look at myself. I’m not saying I’d have joined the sweatpants and gold medallions brigade, but at the age you were I certainly didn’t have the patience or presence of mind that you needed to survive. And I honestly don’t think I’d have come out the other side as half the man you did (and no, that’s not a tall joke). You’ve been through a lot. Times are certainly better now 🙂 I have a couple of questions. Re: your contracted cough- weren’t there many people that had asthma? If so, how did they treat respiratory illnesses (ongoing ones) if medication was hard to come by? Could anyone see doctors? Did those who were paid for jobs worry about break-ins and being murdered for their goods – or, were there safer parts of the country than other parts where people were buffered from this type of crime? Btw, I realize I am inferring questions from more than one post. I don’t know how many people had asthma; back then, when all our troubles just started (in a long term meaning), I don’t think there were too many people with asthma and respiratory illnesses – my guess is that all of it was in a range like anywhere in Europe or US. Our pharmaceutical industry worked as long as they had enough raw materials to make medication; after that, since we were under economic sanctions, they gave their best to make something. But it was not enough and people were buying it abroad and then re-selling. It was not all legal but there were no other options. At one point, we got a huge donation from China but their antibiotics would cure the illness but at the same time cause a lot of other problems – ulcers, rash, stomach problems, etc. I guess Chinese people are used to them but it was not good for us (I never tried them, though, I was prescribed once but refused to use them). I will tell you how I treated my cough. I took two boxes of antibiotics but it didn’t help at all. When my cough became worse and I started coughing hard during night, my grandma forced me to use some… medicine… they were using when she was young, before WWII. She cooked two onions in 2 litres of water and I needed to drink that water. The taste was awful, I felt like I would throw up, but in less than week I was cured (I was drinking between 1.5 and 2 litres every day). My lungs were cleaned and everything was fine. But doctors didn’t have a choice: they would prescribe antibiotics or vitamins, if the virus was a cause and that was it. Patients needed to find their own way of buying it. Or they would try something like I did. I know that some people, especially in rural areas, exchanged goods but in shops it was not possible. At one point almost everywhere we could use German Marks to buy stuff, our currency was worthless. Most of the salaries were just too small so people haven’t been afraid of being robbed. People were poor and you could see that – clothing, cars, furniture,… it was all old and of low quality. But if someone would buy a new car, for instance, even a cheap one, someone would pay attention. And I guess those people were not feeling safe, at all. People would start talking and there was a possibility that someone will try something. I mean, it was not a rule but it could happen, if you know what I mean. And no, there was no “safe area”. So, onion water and it worked for you. Are there any other special remedies or treatments from your grandparents or parents or you that you care to share? Thanks for the reply, Darko. Err… I will have to think about that. There was some plant that my grandma used to control a sugar level in her blood. Also, she used to boil the water and then put a dry pomegranate peel in it and then drink it when cools down. She was saying it helped her when she was having bacteria in her bladder. There are some remedies that my grandpa was taking for his asthma. There is a web site in Serbia dedicated to publishing those kind of remedies but it is only in Serbian. If you need something, I can try to find and translate it for you. Pomegranate peel sounds better than onion water 🙂 Anything that clears chest congestion, croup, upper respiratory would be helpful. Also, prevention for flu other than immunization. And inflammation in general. So, curious about three things really. No rush at all. Even a few tips would be appreciated, Darko. Darko, I remember my parents also used to go to Hungary to buy food. I liked their Vaj krem. And clothes we usually bought just once a year in flea markets 😦 I was happy if I would got socks for Christmas. Yes they still make Vaj krem, but now there are more kinds 🙂 One winter sis and I had to wear old, in pretty bad shape jackets, it was freezing…because the salaries of my parents weren’t enough to buy 2 jackets 😦 Then father got some bonus from his firm because he worked there 20 yaears. San and I were there last August but just on a brief visit, ten days or so. I am not sure when we will go next time. As if you described the situation in Syria with one difference ,here blood is flowing every where ,i wonder if i would write post a bout this nightmare one day ): . I think you will, with some time in between, once it is over. Now you need to survive all of that first. Well, I’ve heard that were so many similar things between Vietnam and Serbia and now I see it more clearly. Really interesting Darko. I agree with Words when he says “I think very few of us in the West really understood what was happening then, or the impact it had on day-to-day life.” It’s good to have a first hand account from you. Thank you and looking forward to reading more. Thank you for reading, Pam. And good to see you around, here and on FB, as well! Yes, but I’m sure slow in catching up. As you can see, it was 14 days ago you responded to me. Sheesh……don’t think I ever will but I’ll keep plugging away. I like keeping in touch.